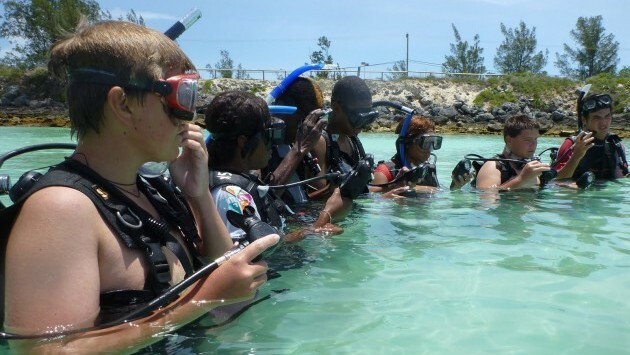 BAMZ junior volunteers practice SCUBA skills in Whalebone Bay during the Discover SCUBA camp. The shared mission of Bermuda Aquarium, Museum & Zoo (BAMZ) and the Bermuda Zoological Society is to inspire appreciation and care of island environments. We fulfill our mission through our animal habitat exhibits, which focus on species from oceanic islands, as well as related environmental education, conservation projects and research programmes. BAMZ, founded in 1926, is one of the world's oldest aquariums. Since 2014 the BIOS Ocean Academy has partnered with the Junior Volunteers Program at BAMZ to offer a Discover Scuba experience. IN 2017, BIOS scientists Leocadio Blanco-Bercial and Tim Noyes received a grant from the Bermuda Zoological Society to sequence 240 of Bermuda's fish species from the extensive specimen collection housed in the Natural History Museum at BAMZ. For more information on BAMZ, please visit their website.